Version 4 of the Restaurant Theme is oh so tasty! We attempted to keep a general essence of the previous version. Otherwise, the theme has been completely rebuilt — and it’s a vast improvement. View the demo to see it in action. The design enhancements are extensive. They include a full width featured slideshow with parallax effects, CSS3 design accents, better handling of featured images and much more. Development improvements are extensive as well, including an updated custom post type for food menu items, use of the WordPress customizer for an insanely easy setup, integrated shortcodes, new page templates, automatic updates and much more! Sink your teeth in to the latest version of the Restaurant Theme! aloha, we updated to WP4 and the menus went wonky eg; items disappeared. Any suggestions? If you’ve experienced an issue as a result of updating WordPress or your theme, then please submit a support request to our forum and we would be glad to help: http://organicthemes.com/support. 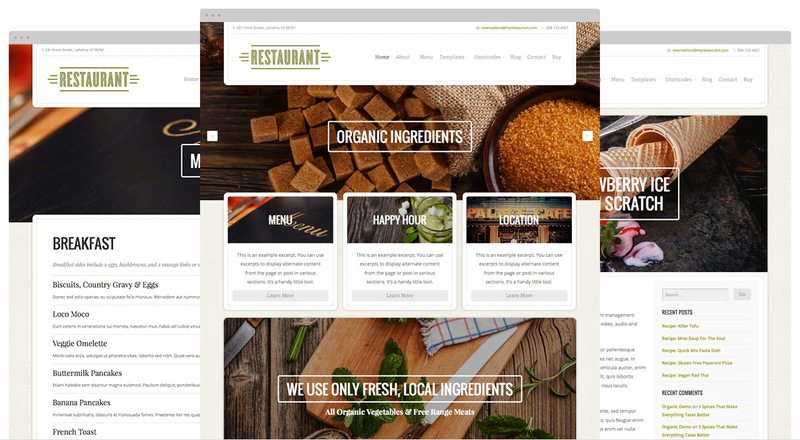 The new Restaurant theme is fully responsive. If you’re not seeing this in place you may not be using the latest version. Feel free to post on our support forum and we can assist you with this.